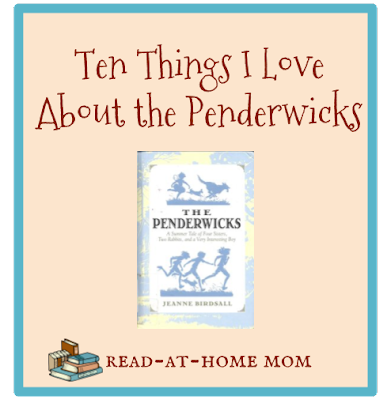 Recently, I read The Penderwicks and The Penderwicks on Gardam Street by Jeanne Birdsall. The first book follows four sisters - level-headed twelve-year-old Rosalind; imaginative eleven-year-old Jane, feisty ten-year-old Skye, and eccentric four-year-old Batty - and their father, a widowed botany professor to a cottage in the Berkshire mountains on the grounds of an estate known as Arundel, where they befriend a lonely boy, despite his mother’s misgivings about the girls. The second book follows the girls home to Gardam Street, and introduces us to their wonderfully rich home lives, and introduces the difficult situation of the girls’ father beginning to date after living four years as a widower. I loved many more than ten things about these books, but for the sake of blogging, I’ll keep it to ten. Dad speaks Latin. I don’t know a word of Latin myself, but Mr. Penderwick is a botany professor, and he speaks to all of his children in delightful Latin phrases. I especially love that the author doesn’t translate them for us. If we want to know what’s being said, we have to look it up! The Penderwick children are well-read. The ChildLit wiki provides a full list of the books referenced in the second book, but they are very much present in both. Eva Ibbotson, Arthur Ransome, C.S. Lewis, and many other wonderful authors’ names appear in the story, and the girls are familiar with each one. The fact that only older, more “classic” authors are mentioned also adds to the timeless feel of these books. Each of the Penderwicks has a distinct unique personality. I think this makes the books hugely relate-able to kids. The Penderwicks feel like real people to me - especially Batty, who is my favorite - and I could also see something of myself in every one of the girls, despite their differences. Batty. I love every move this character makes. From parading around Arundel in a pair of wings, to voicing the family dog’s innermost secrets, to sitting in her wagon, decked out in unusual ties, she is delightfully strange, and completely adorable. MOPS, MOOPS, and OAP. The Penderwick sisters have secret meetings - MOPS stands for Meeting of Penderwick Sisters, which is a meeting all the girls attend. MOOPS means Meeting of Older Penderwick Sisters, and excludes Batty. The OAP is the Oldest Available Penderwick, who is to assume responsibility for the younger ones, and for upholding the family honor. I love the little views these books give us into the mindset of children, and I especially love the idea of children organizing themselves like that without parental involvement. Remembering Elizabeth Penderwick. Though the girls lost their mother to cancer, her memory lives on through the stories Rosalind tells to Batty at bedtime, and by the way each girl remembers her, and speculates as to what their mother would think about various situations. I also love the way Mr. Penderwick hasn’t forgotten his beloved wife, and even as he prepares to go on a date in book two, still mentions her and how she knew better than to talk through a symphony performance. The absence of technology. While the second book felt much more contemporary than the first, these characters are still not texting, surfing the internet, or chatting online with their friends. I think this contributes to the feelings of nostalgia it brings up for adults, and I think it also encourages kids to remember all the things they can do when they’re not being bombarded from all sides by flashing messages from fancy gadgets. The family honor. There is great concern on the part of the Penderwick sisters that the family honor not be in any way tarnished or destroyed. Sometimes they take their quest to defend the family honor a bit far, but their fierce loyalty to their father and to each other is admirable. Love. The Penderwick girls who have crushes do so in an endearing and realistic way. And the books aren’t romances. Crushes are resolved in these books the way they often are in real life - imperfectly, and sometimes heartbreakingly. There are more to come! The best thing about the Penderwicks is that their story isn’t even half over! The third book, The Penderwicks at Point Mouette will be published this May, and there are two more books planned after that. I eagerly anticipate each one, and hope they live up to the high standards established by the first two volumes. I've read the first one but not the second! The audiobook is really good.